Join the list of satisfied customers that are using Shocker hitches. The Air Shocker provides the ultimate smooth ride. The Receiver Air Shocker is a miniature air suspension unit mounted between your truck and trailer. This Shocker mounts by sliding into a standard receiver tube. The air bag sits under the receiver tube allowing a short distance of 10-inches between mounting pin and ball center. You will find the advantage of the Air Shocker is your ability to adjust air pressure for best ride and load control. Fits std 2" receiver tube, 2 1/2" shank available. The only Gooseneck Air Hitch to exclusively work in a forward and back motion, often times this is the jerk you feel when towing gooseneck trailers. Helps to eliminate the jerks felt when towing on rough roads or concrete highways. This hitch directs the tow resistance through an air bag, producing a smooth ride. Shown w/ Ease Guide coupler, built in funnel to guide ball for easy trailer hookup. Available w/ Bulldog BX1 coupler to fit flatbeds with recessed pocket. Fits most trailers - Available with a 4" round, 4" or 4 ½" square tube stem. 24,000 lbs towing capacity - 6,000 lbs tongue weight. How Do I Know If I Need A Shocker Hitch? In a perfect world the roads would be freshly paved and smooth as glass. In reality many roads are busted up concrete and a long way from smooth. The good news is that by using a Shocker Hitch you can smooth out the rough roads and make towing your horse trailer a pleasurable experience. The Shocker Hitch not only benefits you, it also reduces the jerking and jarring to the trailer and your horses. 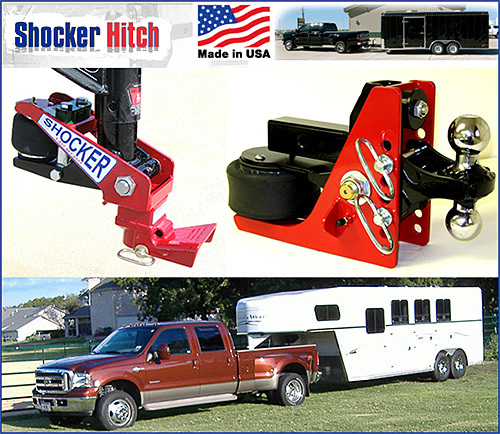 Shocker Hitch models include both Gooseneck style and Receiver/Bumper pull models. How Does The Receiver Air Shocker Work? How Much Air Do I Put In? Receiver Hitch: With your trailer hooked up to the tow vehicle, and loads positioned for transport, air up shocker until main frame rotates and lightly compresses top bushing. Gooseneck Surge Hitch: The Surge hitch is a low pressure hitch, simply add one psi of air for every 1,000 lbs of towing weight, for example, the average horse trailer with living quarters weighs 20,000lbs = add 20 psi of air. The Shocker Hitch is designed for ease of use and comfort. This is a sealed system that will hold air for weeks or months. If you haul the same trailer with the same load weight, it should be good for quite some time. How Do I Know If It Will Fit My Truck? We have made sure that the Receiver Air Shocker will fit into Ford, Chevy, Dodge and SUV’s. There are some clearance issues with the Chevy Envoy, Ford Explorer, some imports and service body vehicles where the body extends below the receiver tube. The Gooseneck Surge Shockerhitch is available with either the Ease Guide coupler featuring a built in funnel guide to make hooking up easier, or the Bulldog BX1 coupler when the truck is equipped with a flatbed and ball is in a recessed pocket. How Much Does An Air Shocker Weigh? The Receiver Air Shocker weighs 40 pounds and the Gooseneck Surge Shockerhitch weighs 75 pounds. What Do Customers Say About The Air Shocker? I purchased a shocker air receiver hitch after driving semi for 29 years. I am retired and pull a 20ft equipment trailer with my ford superduty F350. This hitch smooths out the ride, especially when empty. Thanks for a Great Product!! I am informing all my friends about it!! Dear Shocker Hitch,I just purchased a receiver mount hitch and It works well. I would say it takes out at lest 50% of the shock from towing my Airstream. In 2009 I purchased my 1st receiver hitch from Shocker Hitch. I was executor of my Aunts Estate in Ft Worth Tx, and I live near Lubbock Tx, 6 hrs 1 way driving distance. I was pulling an enclosed 14 ft tandem trailer to haul estate "stuff" to various kinfolk. Needless to say the ride in the pickup was rough, when pulling the trailer with a regular ball hitch, to say the least. I purchased the Receiver Hitch, after seeing it advertised in Farm Show Magazine. My wife said, "You paid how much for a trailer hitch". But after 1 hr of travel - pulling the trailer attached to the Shocker Hitch - my tough critic became a believer, saying it was the best money I ever spent. She could do her NeedlePoint work, read, and relax without the constant banging, jostling, and rough riding caused by the trailer being pulled. Christmas, 2010, I purchased 3 more receiver hitches for my 2 sons and 1 son in law. They already enjoyed the hitch, as they have borrowed mine when they had any serious, long hauling. To anyone who pulls a trailer and is tired of the constant banging, jarring ride, it will be money well spent to purchase a shocker hitch. Many things purchased today don't work as advertised, this Shocker Hitch works as good or better than its advertisement. It Works. Order Your Shocker Hitch Today! You spend thousands of dollars every year on the care and protection of your horses. With the Receiver Mount at $399 and the Gooseneck Surge at $799, Shocker Hitches are affordable for everyone and the results are well worth the money. A bad ride can leave your horse exhausted-- or worse! Make sure you protect and provide for their comfort during travel! For more information about our products and to place your order, please give us a call today!